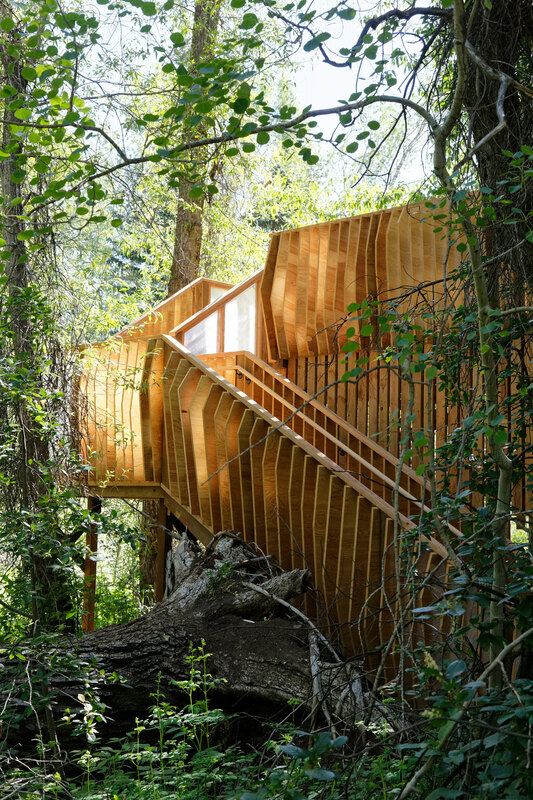 Hallam Lake, a 25-acre nature preserve and environmental learning center, is home to the Aspen Center for Environmental Studies (ACES). The property was donated in 1968 by Elizabeth Paepcke when she founded ACES, and is open to the public year-round, providing an inspiring setting for ACES’ many educational and naturalist programs. 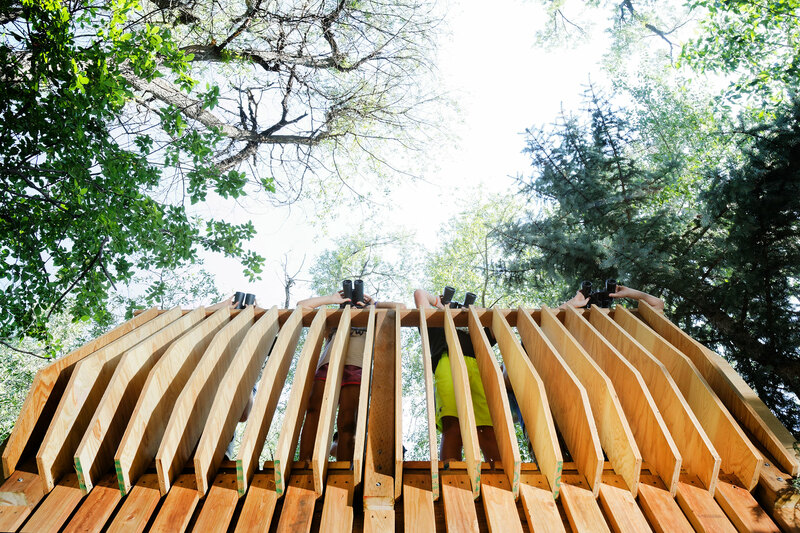 The lake and existing viewing platform were annexed into the City of Aspen. 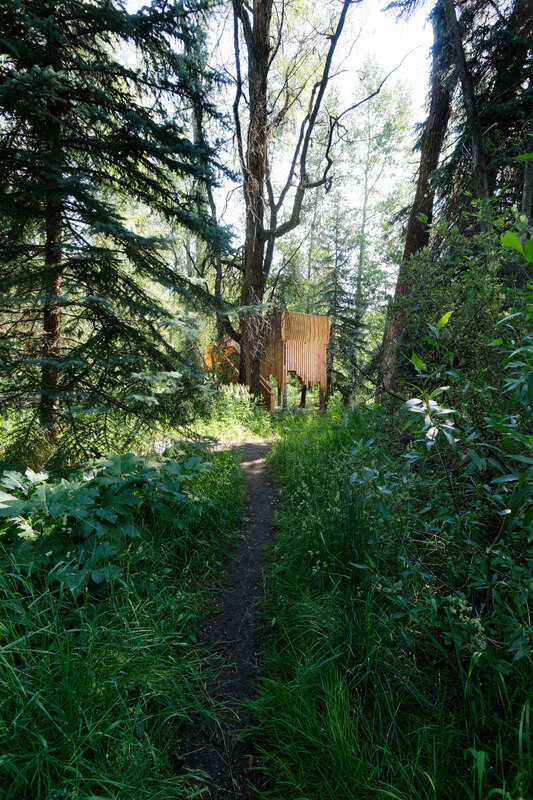 The platform is located on the half-mile nature trail that meanders through the property on the banks of the Roaring Fork River. After years of weathering and decay, the platform was re-designed by Charles Cunniffe Architects (CCA) in collaboration with ACES. The new design and construction utilized the original four column structure. An interesting path led to the execution of a new viewing platform. 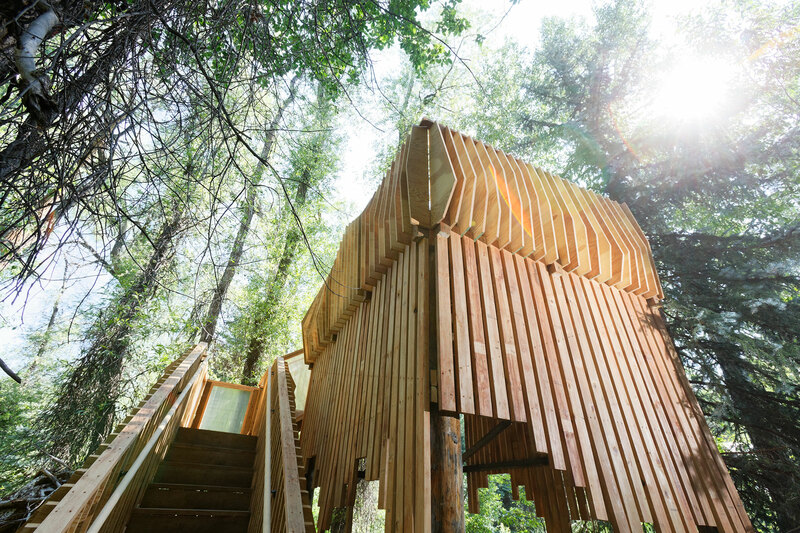 CCA donated a tree house design to the Buddy Program for its annual fundraising auction. 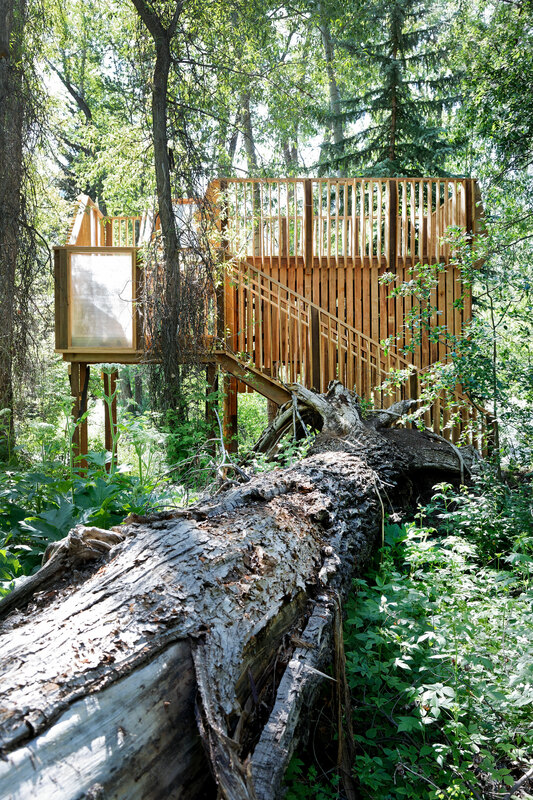 Gunnar Sachs purchased the tree house at the auction, and in turn donated it to ACES. CCA asked Hansen Construction to donate staff time and materials, and Valley Lumber then provided discounted building materials. Over a year of design time by CCA staff resulted in the final design and lengthy approvals process through the City of Aspen. LGM provided the C&C routing at-cost, and Sopris Engineering provided extensive surveying pro-bono. 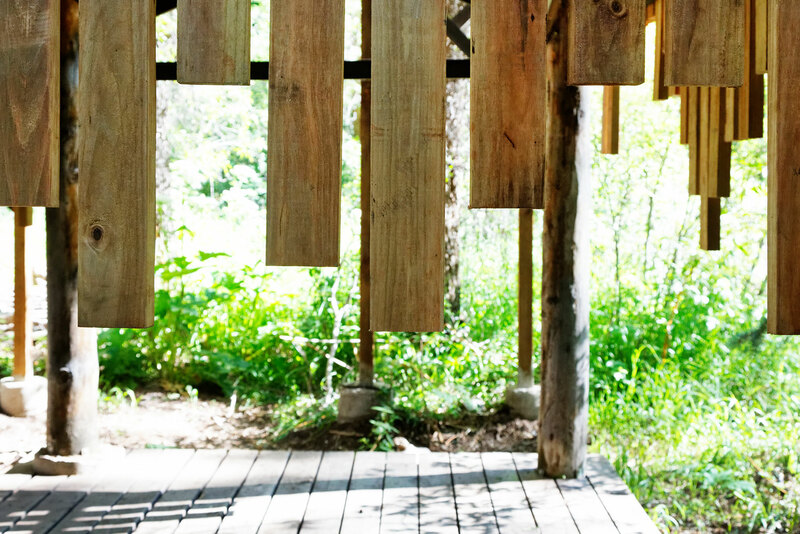 This was a true community-based project that each firm involved was happy to support. Hallam Lake is home to resident birds of prey and lush riparian ecosystems including woodland, meadow, pond and marsh communities. Utilizing the existing four pillars, the goal of the design was to create different stations to enjoy the various aspects of the ecology. Approaching the platform from the trail, one is surrounded by a stand of Cottonwood trees, including a downed tree worth exploring. 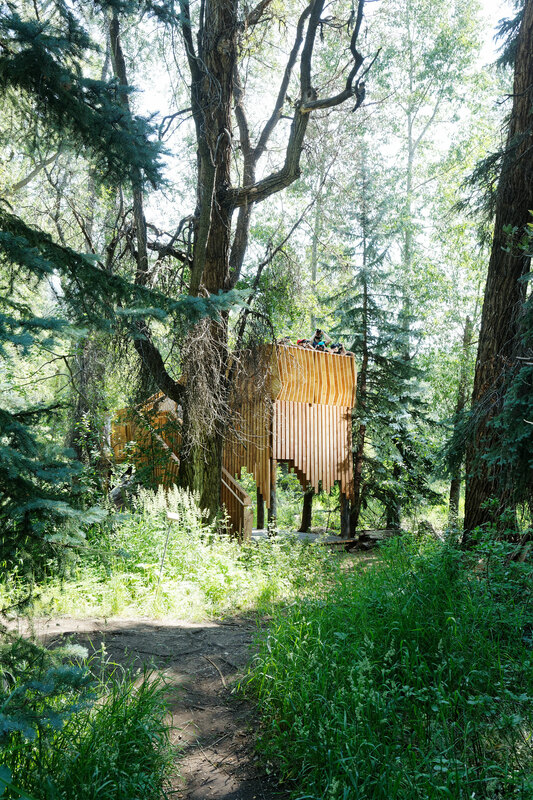 It feels as if the structure belongs in its environs, and beckons you in. 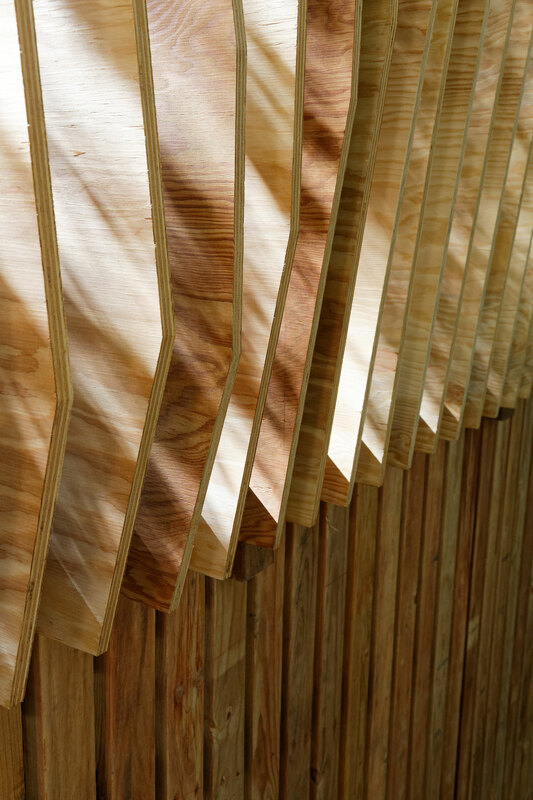 Marine-grade plywood meticulously formed with C&C router forms the exterior, with polygal for visual relief. Walking into the lower space, one can experience the river ecology and be protected, should inclement weather present itself. 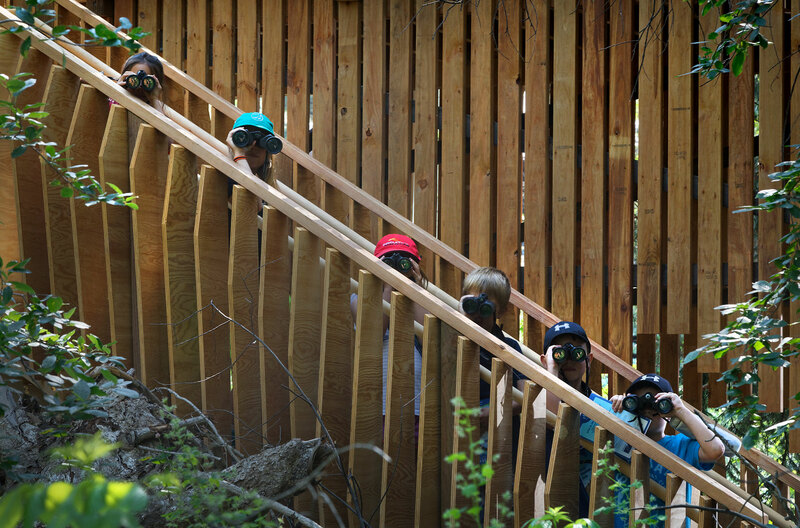 Ascending the steps to the upper level of the platform allows viewers to watch the swallows in search of insects, the American dippers diving underwater, deer, foxes, bears, ACES resident Golden Eagle, Great Horned Owl and Red-tailed Hawk; all the while designed so children and adults alike, can view without scaring the wildlife away. 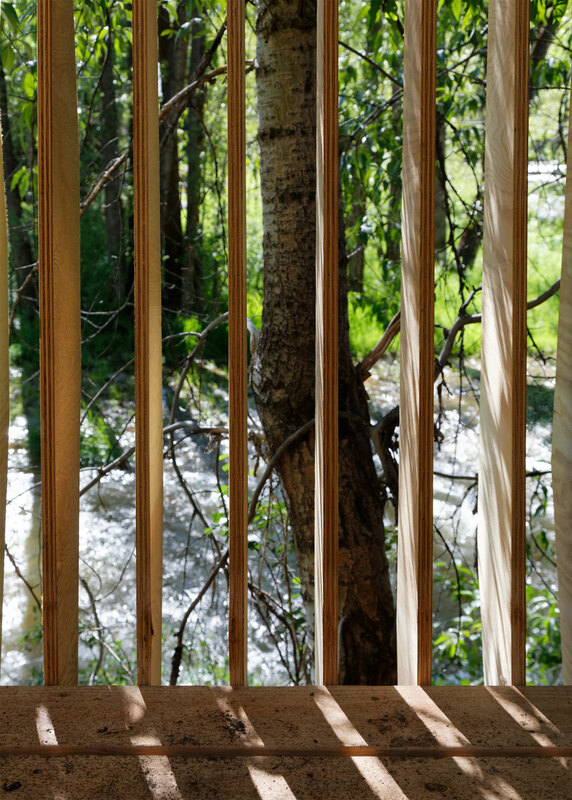 Vertical elements in the Cottonwood bark were the color and orientation inspiration, and the use of the existing materials harks back to ACES and CCA’s philosophy of re-use. 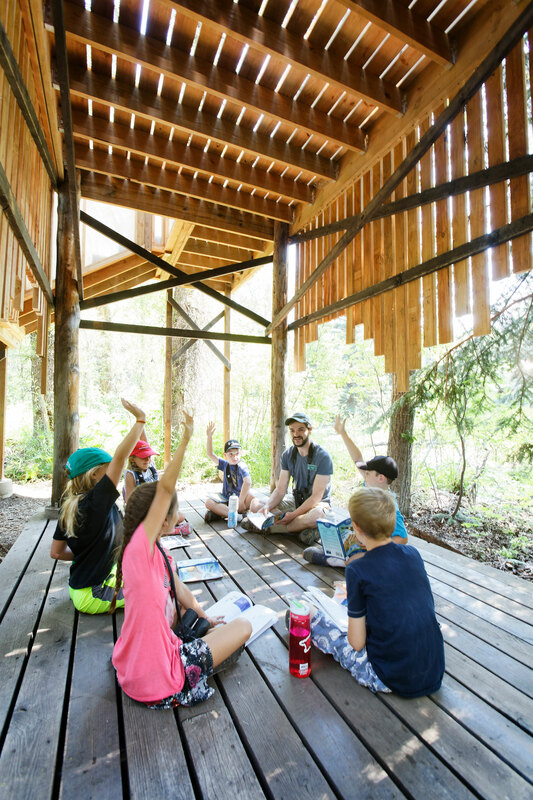 ACES naturalists conduct ecology classes at this ‘outdoor classroom’, and by placing students in the heart of the ecological space, they can witness first-hand, the wonders of nature.